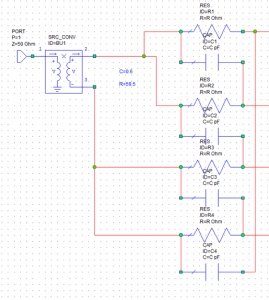 We’ve talked a lot about IQ mixers in the last few posts, about their theoretical underpinnings and applications as a phase detector and phase modulator. 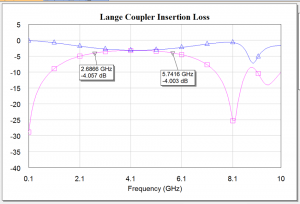 In upcoming posts we will discuss applications of image reject and single sideband mixers as well. The key to all of these circuits is the quadrature phase shift, both at the LO side for an IQ mixer, and at the LO and IF side for an image reject or single sideband mixer. Remember: a phase shift is not the same as a time shift. This is one of the most difficult concepts to grasp in RF, microwaves, and optics. We will begin with the trivial example of a time delay, just to show that this doesn’t work for anything but the most simple circumstances. 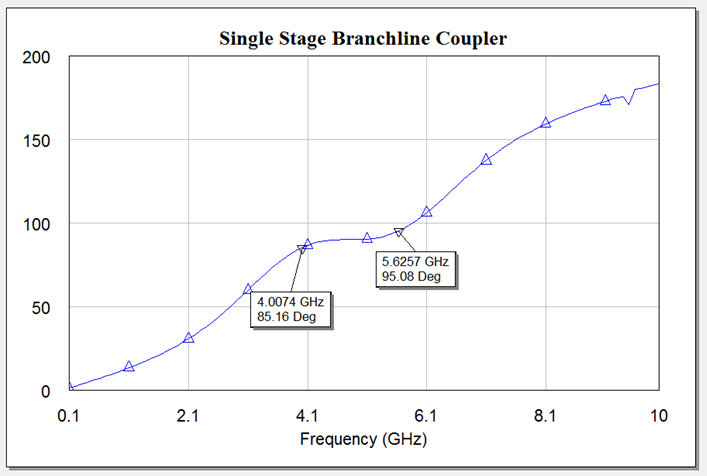 We go on to show how different techniques can be used to create more flexible and useful quadrature phase shifts to ultimately realize our goal of an ideal, broadband IQ/image reject/single sideband mixer. 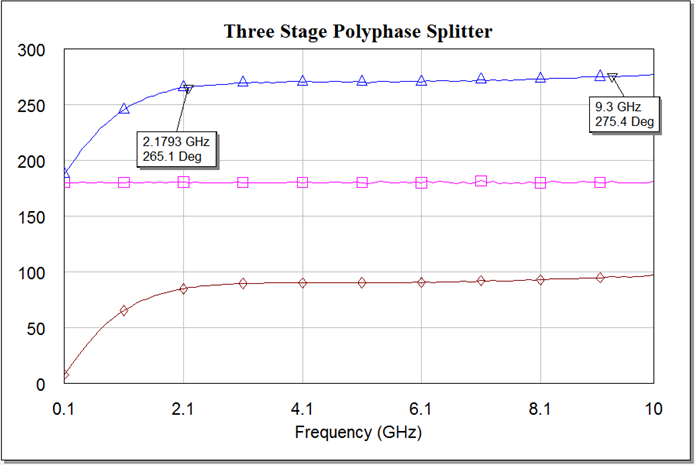 Ed Note: Since this original post much of this content has been updated and combined into our IQ, Image Reject, and Single Sideband Mixer Primer. Check it out! These techniques are ranked below from worst to best, where quality is roughly defined by phase and amplitude balance over bandwidth. Any of these techniques might be the correct one for your application, it just depends on whether you are building a demonstration system in your lab, designing a communications chip for a cell phone, or trying to make a radar scanner. An ideal phase shifter in our mind would have perfect phase and amplitude balance from DC to daylight. 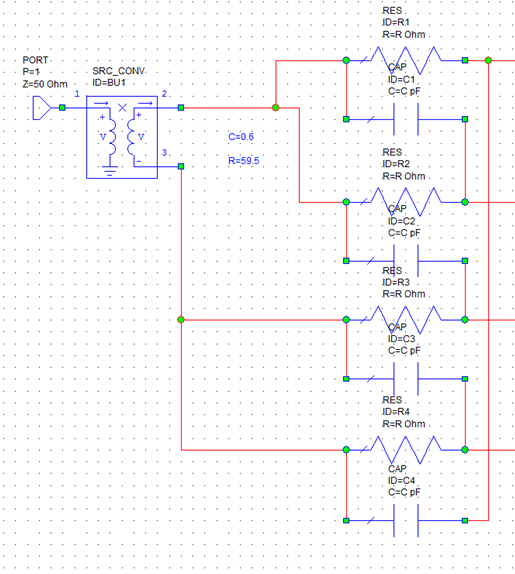 This is the trivial case, where you just put the signal through a power divider and then time delay one side. 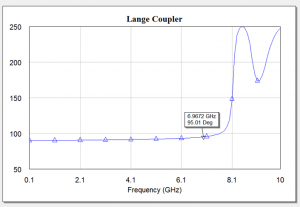 If you have a tunable time delay, and you want a fixed frequency LO, this can be used to get very accurate 90˚ phase differential. If you have a low loss time delay, the amplitudes will also be matched. 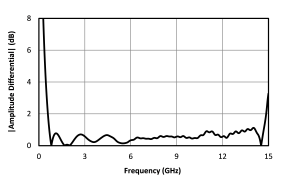 It only works at a single frequency, though, in the graph below only at 5 GHz, for example. Here the bandwith is 38% without increasing the insertion or return loss, but the impedance range gets higher, so it is harder to interface the lines in a single circuit. It becomes increasingly difficult to expand the bandwidth this way. So if you only need 30% bandwidth or so, and can sacrifice the space, this is a fine choice for communication applications. Schiffman comes in at number five primarily because it is not used often enough, probably. 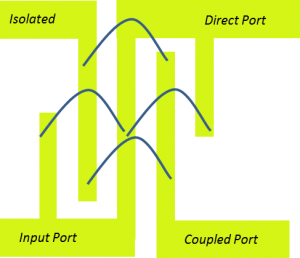 It is similar to the stripline coupler later in the article, but it provides a broadband phase shift (not a time shift) to an existing signal. This is difficult to visualize, and you need to have a pre-existing power split so that you can run one signal through the Schiffman, and one signal through a matched delay line. If used properly it can take a differential signal and turn it into a set of quadrature signals. Now this is a very broadband phase shift. 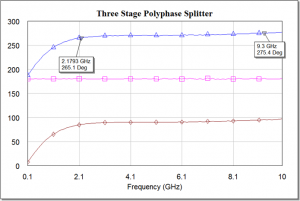 The cost is that each stage adds another 3-4 dB of insertion loss, meaning that the broadband three stage phase shifter has over 10 dB of insertion loss, in addition to the splitting loss. Further, since it is implemented with lump elements it cannot be made at high frequencies where the capacitors and resistors resonate. 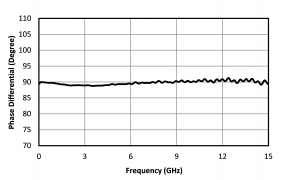 However, at low frequencies it works quite well, can be made cheaply, and is suitable both for LO splitting and data combining for image reject/single sideband use. 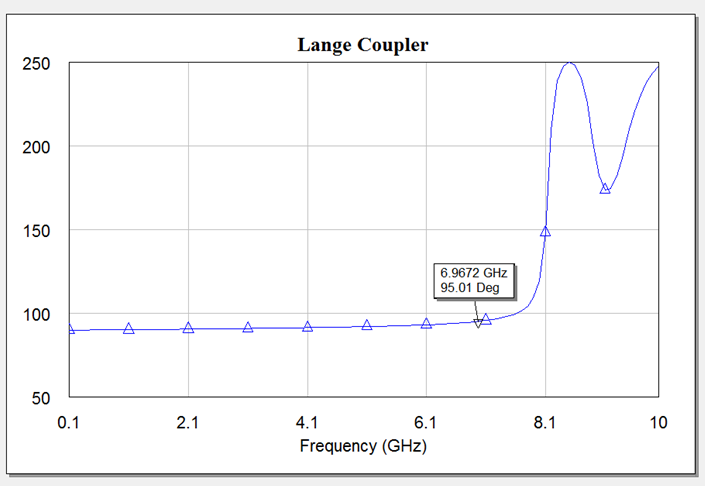 The Lange coupler is the most common device used in MMIC balanced amplifiers and other balanced technologies. 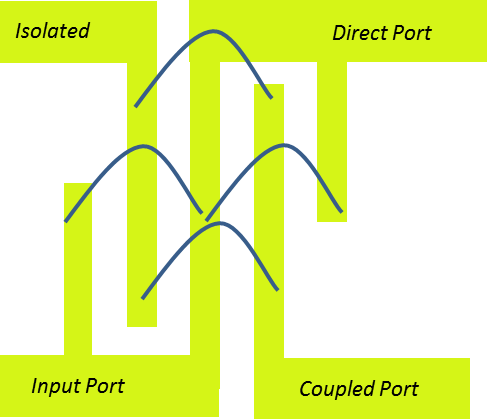 The fundamental problem of planar couplers is that two edge-coupled microstrip lines are very weakly coupled unless the gap between them is very small. This is limited by the fabrication tolerances of the process, and so 3 dB couplers are difficult to realize. 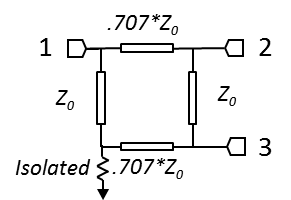 Lange couplers solve this problem by using wire bonds or air bridges to connect different fingers of an interdigitated coupling structure, as shown below. The four finger Lange Coupler shown can have a pretty good bandwidth, around an octave or more in insertion loss/amp balance, and very good phase. The amp balance can be expanded by going to more fingers, but this comes at the expense of phase balance. Overall the Lange coupler is an excellent choice, and really the only one if you have a quasi-two dimensional structure. 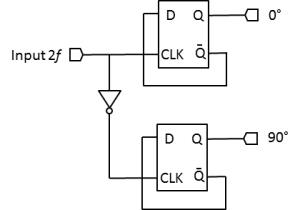 When implemented in CMOS or SiGe this circuit is usually differential, meaning that it will provide all four phases of the output signal. 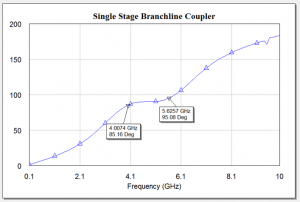 These can be made very fast, up to 30 GHz outputs, and work down to arbitrarily low frequencies. In addition to the need for a double rate clock there are a few other drawbacks, however. Since the circuit uses limiting circuits, it is not suitable for analog inputs (meaning that it obviously can’t be used for data). It also cannot be used for combining two signals, even at a single frequency. If there is any duty cycle distortion or level distortion on the input, it will show up as a phase distortion on the output. Also any amplitude noise on the input will show up as phase noise on the output. So in general this is not a very good device as a quadrature splitter, but it is excellent for the narrow purpose of creating an LO drive for an IQ mixer. 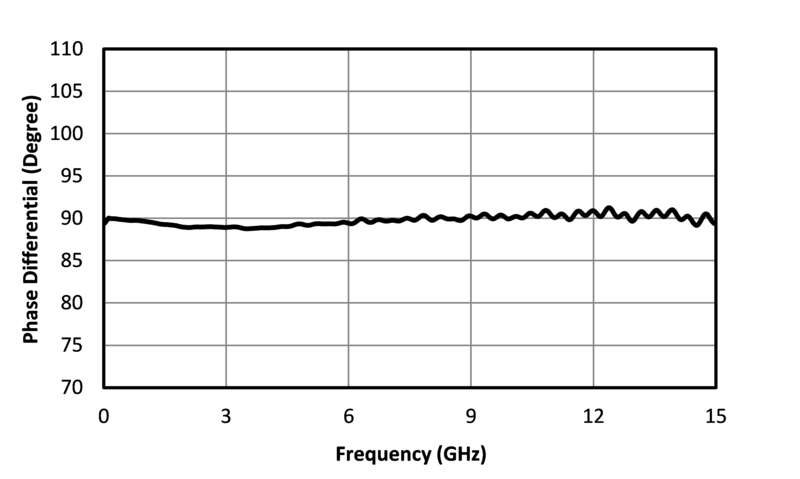 This is what is frequently used in low frequency silicon RFICs for LO clock generation, which means that it is abundant. This is the gold standard for quadrature signal generation. It can operate across a broad bandwidth (2 to 26 GHz for example), it has excellent balance in both amplitude and phase, and it can be used on the data side of an image reject or single sideband mixer to get better than 20 dB rejection. These are generally built in a tri-plate stripline construction, which has the physical advantage of matching the dielectric constant around the circuit. This construction is also capable of handling 20 watts of CW power or more. All stripline directional couplers will create a 90 degree phase shift, so in theory any of them could be used to create the LO drive for a mixer. The trick is to find a way to make the coupling strong enough to create a 3 dB coupling. There is nothing magical about this, it just has to be carefully engineered to be critically coupled across a broad bandwidth. Below we show the basic coupler circuit, along with the amplitude and phase deviation that can be achieved, in this case by the QH-0R714 quadrature hybrid. 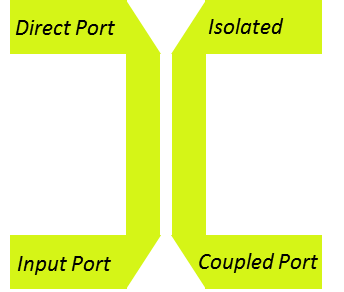 Trying to integrate these is difficult, however, because they require a multilayer construction for broadside coupling. Additionally, they need to be in a material that has good dielectric properties. Fortunately for us, the Microlithic platform has both of these things. 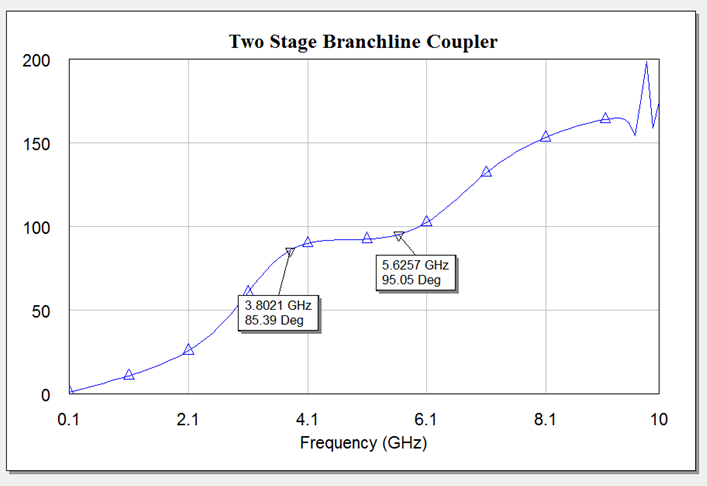 That is how we are able to make the only 2-18 GHz integrated IQ mixer in the world, the MLIQ-0218. This device is amazing because the LO hybrid is so difficult to make. The fact that it can achieve 30 dB of image rejection, despite being in such a small package, is amazing. This is also the key to our other Microlithic IQ mixers, the MLIQ-0416 and the MLIQ-1845. 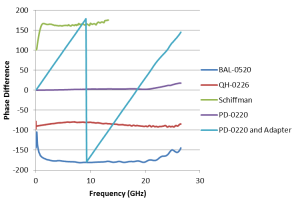 So, what is the future of quadrature phase generation? 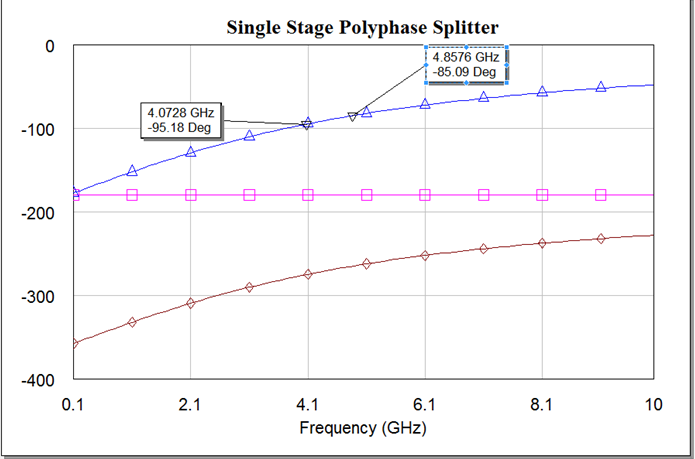 Certainly IC processes will improve, making higher frequency digital phase splitters more available at higher frequencies. Simultaneously, more systems are designed where both I and Q signals are being directly converted to digital signals, and then a quadrature phase shift is applied digitally. 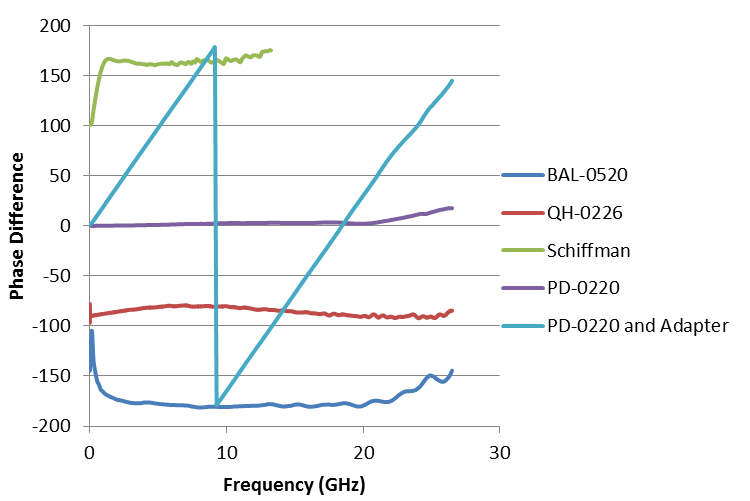 As IC processes and design improvements push ADCs to higher and higher frequencies, IQ and single sideband functionality will be available directly from software defined radios and the like. However, for zero power consumption and high power handling, we believe there will always be a place for analog hybrid couplers. 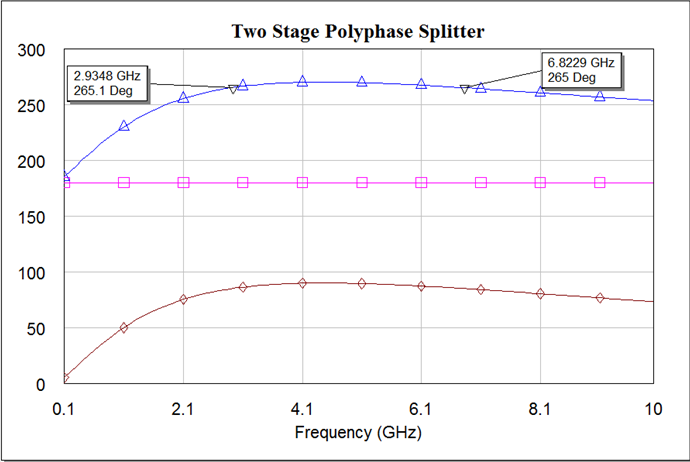 One thing to note on the digital phase splitter, the two flops must be resettable or you can’t guarantee what phase relationship will be between the two outputs. Either it’s 90 degrees or it’s 270 degrees. This is due to the fact that you can’t know what state the flops will be in when powered up unless there is a reset circuit. A better solution is to tap out the master latch output’s directly from the first flop to generate the first 90 degree phase shift. Wow that is a really good point that I had not considered. 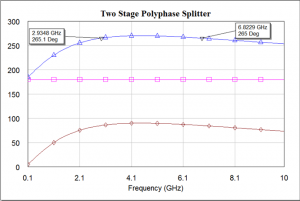 If the phase of the digital splitter is set inconsistently, then you would randomly get one sideband or the other from a single sideband conversion. This is pretty important. 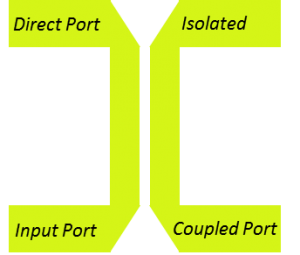 For the digital phase splitter the best configuration is: !Q1 connected to D2, Q2 connected to D1; both flip-flops using the same clock. This will generate a sequence with a well defined sign of the phase shift: 00,01,11,10,00 . Another idea is to use a Johnson counter. That is simply a series of FF’s all clocked by the input clock. All FF’s must be initialized by way of resets except 1 FF being set. This 1 is rotated around. With two N FF’s you get divide by N with 1/N duty-cycle. Useful if you want divide by 4 and 25% duty-cycle. In this case, the quadrature generation is tapped out from any two adjacent FF’s. It’s quite easy to get back the 50% duty-cycle from even number N division greater than 2. A cool feature is that you can divide by any integer (even or odd) since it’s just a counter. Cheers. This is an interesting technique, I am curious what kind of frequency response you can get out of a chain of flip flops like this. 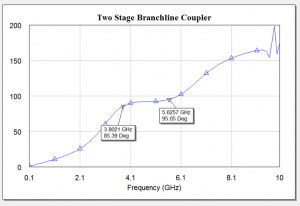 Can you name a discrete module/IC for a digital phase splitter? I need one that is capable of working inthe frequency range of 1MHz to 50MHz. I don’t actually know of anyone that sells low frequency modules, since that is not our area. Below 100 MHz you could easily build a surface mount or through hold board with some D flip flops and build your own T-flip flop to make a quadrature splitter. I don’t know of anyone that actually does this in a module format. The Johnson counter does not need a reset if you have only 2 flip-flops (FFs). Also with 2 FFs you have 4 outputs so you get all 4 phases (0, 90, 180, 270). As all the FFs are clocked simultaneously, this is type of counter has higher frequency response compared to a ripple counter consisting of 2 FFs.